Research shows drinking too much wine raises your blood pressure. It raises your blood pressure right away temporarily, according to the Mayo Clinic, but repeatedly drinking too much can raise your blood pressure long-term. On the other hand, some studies suggest wine protects against heart disease. The key is drinking the right amount. The American Heart Association, or the AHA, describes blood pressure as a measurement of the force pushing outward on your artery walls. When your heart beats, it creates pressure that moves oxygen-rich blood through your arteries to your organs, which need oxygen to survive. If this pressure is too high, your arteries get stretched beyond healthy limits, according to the AHA. This can lead to a heart attack, stroke, kidney failure and other serious health problems. The AHA indicates one in three Americans has high blood pressure. While the Mayo Clinic reports having more than three drinks at one sitting can raise your blood pressure temporarily, the AHA indicates drinking wine doesn't seem to have an adverse effect on your heart unless you drink too much. In one large study, men who drank 300 to 499 milliliters of wine or other alcohol per week had blood pressure readings several points higher than non-drinkers; drinking more caused their blood pressure to go up even higher. Drinking 300 milliliters or more per week also caused blood pressure increases in women, but not as much as in men. 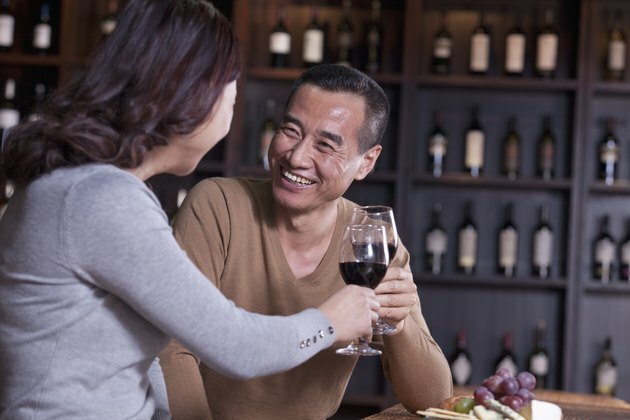 The AHA notes many studies show drinking alcohol, especially red wine, reduces the risk of death from heart disease, possibly due to wine's antioxidants. The AHA recommends that men have only one to two glasses of wine per day and women have no more than one glass. A glass of wine is defined as 4 ounces. If you're a heavy drinker, cutting back to this amount can lower your systolic blood pressure, or the top number in your reading, by two to four points, and your diastolic blood pressure, or the bottom number, by one to two points, reports the Mayo Clinic. Normal blood pressure is less than 120 mm Hg over 80 mm Hg. Because wine also provides some heart benefits, both health organizations recommend enjoying it in moderation. If you already have high blood pressure, talk to your doctor about whether it's safe to drink wine moderately. The College Drinking website of the National Institute on Alcohol Abuse and Alcoholism offers the following tips to help limit your wine consumption. Write down your reasons for cutting down, record the limit you have set for yourself and keep a drinking diary. When you drink, sip slowly, take an hour break between drinks, eat food while drinking and have a glass of soda or water along with your glass of wine. If limiting or completely stopping your wine consumption is difficult, talk to your doctor about getting help. MayoClinic.com: Alcohol: Does It Affect Blood Pressure?